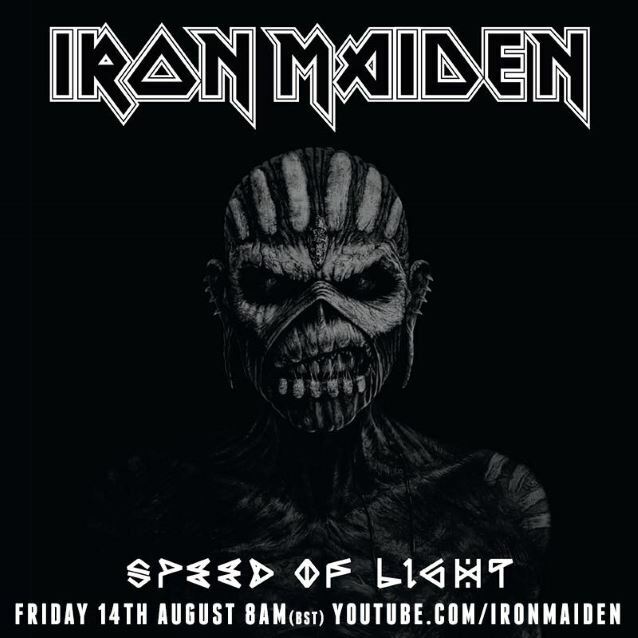 "Speed Of Light", the new single from British heavy metal legends IRON MAIDEN, will make its online debut tomorrow (Friday, August 14) at 8:00 a.m. British Standard Time (BST), 3:00 a.m. EST and 12:00 a.m. PST. The track is taken from the band's new album, "The Book Of Souls", which is due globally on September 4 through Parlophone Records (Sanctuary Copyrights/BMG in the U.S.). A 30-second snippet of "Speed Of Light" is available below. In a recent interview with U.K.'s Kerrang! 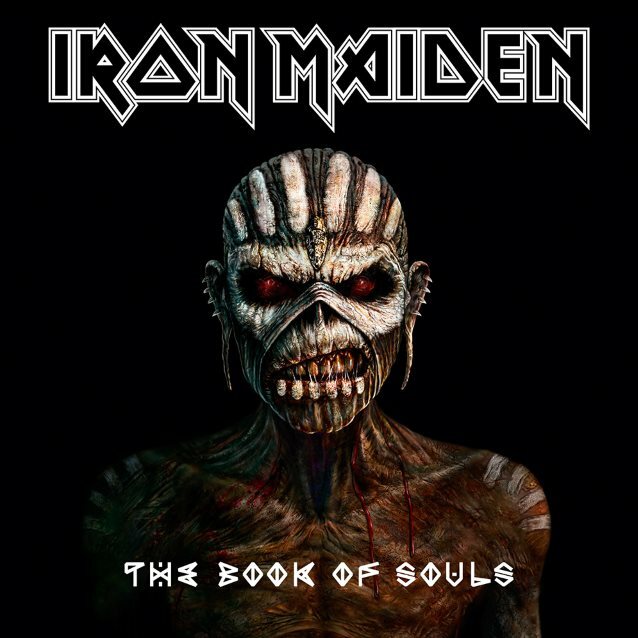 magazine, IRON MAIDEN bassist Steve Harris was asked if singer Bruce Dickinson's cancer diagnosis at the end of 2014 affected the recording of "The Book Of Souls". "Well, it didn't at all, because Bruce didn't know and none of us knew anything about… There was no inkling of any of it," Steve said. "He'd finished all his vocal bits completely anyway, and then there were some other bits and pieces we were doing. Really, we didn't know anything — he didn't show any signs at all. I mean, his singing, when you hear it… He's singing better than ever." He continued: "It didn't cause any problems in that department at all. He wasn't showing any signs of being ill. I didn't even know until a few weeks afterwards, when he got his results back. It was such a shock to him and everybody else, because it just wasn't expected at all." Bruce Dickinson told the BBC about what he has had to deal with in the past six months: "Well, I've just been through what, actually, a load of people go through every day. I mean, 'cause it's thousands of people in the U.K. and around the world who have treatment for this kind of thing. So, in that respect, the only thing that's special about it is that I'm a quite well-known person, so… But I've been fortunate. I had a really good bounceback. And everybody says, 'Hey, it's gone.' So I'm just getting better now, really — healing up." Asked how big the tumor was, Dickinson said: "I had two, actually. One was three and a half centimeters — the size of a golf ball. And the other one was two and a half centimeters, and getting a bit bigger. And that was the only symptom — I had a lump in my neck, and that was the second one. So I went to the doc, and they went, 'Oh, that's a bit weird.' [They] took a scan of it, had a look, had a poke around, and went, 'You have head and neck cancer.' So I went, 'That's a bit of a blow' But you get on with it. You crack on and you get on with it. So… that was it." He continued: "Funnily enough, since I was treated for it, I've met half a dozen people my age who all had exactly the same type of tumor, the same location, all had similar treatments, and they varied in age from 40 to late 60s." Asked how the treatment has affected his voice, Dickinson said: "Well, I mean, speaking voice-wise, everything is fine. I mean, the whole thing is still healing up, so, you can imagine, to get rid of that with radiation has given it… The inside of my head has been cooked, pretty effectively. So, you know, that will all take a while to heal up and it's coming back. But, I mean, I've got… I can sing, I can talk… I haven't gone out and done the equivalent of trying to run a hundred meters in the same way that I used to sing before. 'Cause let it all calm down. I only finished coming out of treatment two months ago, for God's sake, and the doctor said, 'It'll take a year for you to be better.' Well, we've beaten that by about six months so far, but I'm not gonna try and push things to prove a point. We've got loads of time." Harris declined to discuss how the rest of MAIDEN coped with Dickinson's diagnosis, telling the magazine: "It's such a personal matter for Bruce and the band that I don't think now is the time to talk about it. It's Bruce's story to tell when he feels the time is right. The one thing I can say is that Bruce is a trooper and more than ready for the next chapter of IRON MAIDEN. What matters now is that we've got an album coming out that I think our fans are going to love and we're all excited to share with them." Steve commented: "We approached this album in a different way to how we've recorded previously. A lot of the songs were actually written while we were there in the studio and we rehearsed and recorded them straight away while they were still fresh, and I think that immediacy really shows in the songs, they have almost a live feel to them, I think. I'm very proud of 'The Book Of Souls', we all are, and we can't wait for our fans to hear it, and especially to take it out on the road next year!" Bruce continued: "We're really excited about 'The Book Of Souls' and had a fantastic time creating it. We started working on the album in late summer 2014 and recorded it at Guillame Tell Studios in Paris, where we'd done the 'Brave New World' album back in 2000 so the studio holds special memories for all of us. We were delighted to discover the same magical vibe is still alive and very much kicking there! So we immediately felt at home and the ideas just started flowing. By the time we'd finished we all agreed that each track was such an integral part of the whole body of work that if it needed to be a double album, then double its going to be!" Looking ahead to the touring cycle in support of "The Book Of Souls", Harris told Kerrang! : "Whenever we do a new album, we always go out with a new stage show; that's exciting in itself. We always feel like every show is sacred these days anyway, and I suppose even more so now after the scare with what's happened with Bruce. It makes everything more important to us." He continued: "'The Book Of Souls' is a really powerful album, we're really proud of it, and we can't wait to come out and play new songs on the tour. We're really looking forward to it."